When a couple is expecting a baby, both of them can’t wait to meet the little angel when he or she is born. This is why losing a child is the hardest thing that a parent has to go through. Even just thinking of losing a child can be very traumatic. Just like any other couples, Katie and Josh Butler are longing to start their own family. So when they learned that Katie was pregnant, they were overjoyed! They started planning their future with the baby. However, when Katie was 20 weeks pregnant, they received sad news. When they had the ultrasound, the technician noticed that the baby was not growing normally. The doctors looked into it and they had a long list of diagnosis but they are unable to pinpoint what it was. Katie knew that pregnancy is not going to be easy, but she never expected that it would be as difficult as hers. She ended up having to be at the hospital every week so the baby would be able to monitor the baby. Katie was able to surpass the pregnancy. As soon as baby Dewey was born, the doctors were prepared to treat him right away. They took him to the NICU at Monroe Carell Jr, Children’s Hospital located at Vanderbilt in Nashville. He spent several weeks in the hospital and when he was 132 days old, he needed to be fitted with a feeding tube while he has to undergo routine surgery. His tiny heart was not strong enough to survive the procedure and Dewey passed away. 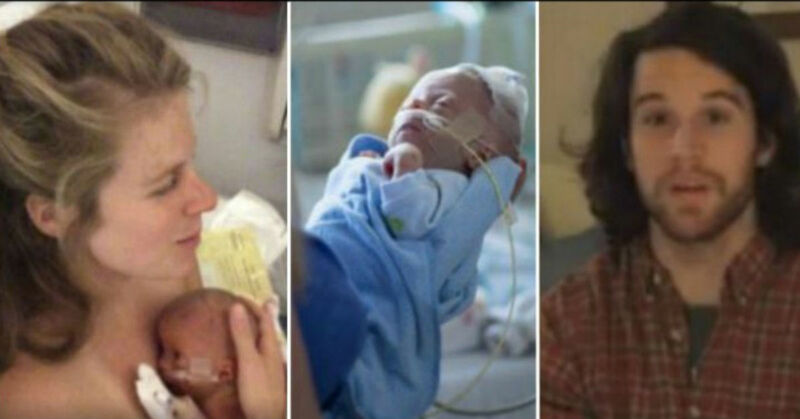 The new mom and dad were heartbroken but they never thought that a miracle would come their way. A nurse called them and asked for them to proceed to the 5th floor of the hospital because they just had a baby and it desperately needs a mom and a dad. This baby boy is Brax and he was born prematurely at 27 weeks. Now, he is 11 months old but he never left the hospital. Brax had chronic respiratory failure, pulmonary hypertension, and he was trach-vent dependent. But unlike Dewey, his health is improving. As soon as they heard about Brax, they never thought twice about adopting him. The couple knew that God led them to this little boy while they are still grieving for the loss of their Dewey. Katie shared that when they brought Drax home, his health improved. He still needs oxygen support but his feeding and movement have impressively improved. There are some instances in our life that no matter how difficult it may seem, it happens for a reason. Despite their loss, Katie and Josh were given another chance to be a mom and dad to this wonderful baby boy. There is no doubt that this couple will be amazing parents and Brax is so lucky to have them as his parents.